We all know one fact to be true – having kids means needing a lot of stuff! A simple trip to the grocery store can mean bringing an entire car full of gear, and it can be overwhelming to think of everything we have to bring when taking a trip away from home. But it doesn’t have to be stressful – and with some planning and creativity, you may be packing less than you expect! Mom and Dad are probably the ones rolling their eyes and thinking, “are we there yet?” on trips with the kids. 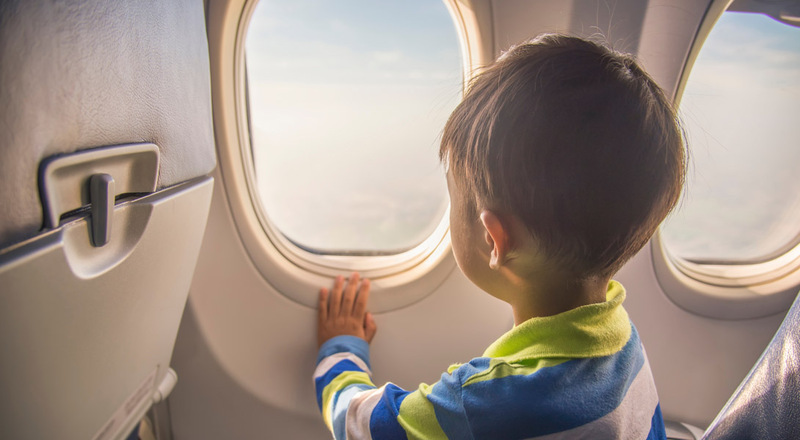 Little ones are unpredictable when their routines change, and it may require a little more on our part to keep them happy, healthy, and entertained during travel. Depending on the mode of transportation, we’ve got some great tips for keeping the kids happy – and keeping your sanity. If you’re flying or taking any form of public transportation, perhaps your greatest concern is keeping the kids seated and quiet so as not to disturb other passengers. There’s nothing worse than dealing with a tantrum on a crowded plane – with nowhere to go! Since we’re limited in what we can carry on a plane, it’s time to get creative. Making busy bags is fun and inexpensive, can be done for all ages and allows you to leave the bulk of their toys at home. These can be made with items from the dollar store and gallon-sized zippered storage bags. They’re quiet, and you don’t have to worry (or have the kids get upset) if a favorite toy is lost on the plane. Busy bags are compact, and several bags of playtime and snack time items can be put in Mom’s purse or Dad’s laptop bag. For young children, snack time and playtime can be combined to keep them busy. Fill one bag with a few lengths of yarn, some squares of construction paper, and a few stickers or crayons. Less is more. Another small bag can be filled with “o” shaped cereal or other bite-sized treats that can be used as entertainment – and food. Cereal like colored fruit rings can be strung on the yarn (a great fine motor skill activity), or parent and child can each pick a color and play a game of tic-tac-toe on a square of paper. Small, colorful snacks can also be used for color matching by placing all the pieces of cereal or small candies of a certain color on a coordinating color of construction paper. The kids can make patterns with different colors and shapes of small snacks, as well. Or draw an ocean background on a square of paper for fish-shaped crackers to “play in” or a forest for bear-shaped cookies. The same can be done with the squares of paper and some stickers. They can draw a few pictures of all the new things they see on the trip, and older kids can make a flip-book or even a small storybook. Challenge them to fold the paper squares into different shapes or show them how to make paper fans. Older kids can spend hours quietly making origami creatures if you bring along a small “how-to” book. And a good rule of thumb in the “less is more” philosophy is to leave the box of crayons at home. All you need are the basics – red, yellow, and blue – to make something creative. It can be a great time to teach about color mixing and blending, and there won’t be 48 crayons on the floor of the plane to search for as you disembark. You can also save space by putting small, wrapped snacks or a zippered snack-sized bag of cereal, puffs, or raisins inside an empty sippy cup. Once on the plane, your little one won’t spill their drink and the snack bags can be discarded when you leave the plane. Busy bags also allow kids to spend some time being creative with old-school materials instead of screen time. Tablets and other devices require bringing chargers, headphones, and can get lost – at great expense. So think outside the box. The kids will enjoy doing something creative with you. After all, this is a great time to sit and talk, draw, and play with them when you don’t have other distractions. Don’t forget to pack a few essentials for unexpected messes – large zippered sandwich bags come in handy for keeping trash confined. Baby wipes can be used to clean seat arms and trays before your kids come into contact with them, and of course, are handy for spills and sticky faces and fingers. And remember to always pack an extra set of clothes – no matter how old your child is. We’ve all dressed the kids in beautiful outfits so they can look their best when family greets us coming off the plane, only to have them covered in a sticky mess or that all-too-familiar diaper blowout. If you have that special outfit picked out, it can help to put an oversized t-shirt on top in case of spills or spit-up that can easily be taken off when you land. When you pack, each outfit can also be placed in a large zippered bag. Kids can grab what they want to wear for the day, you will know it at least matches somewhat, and the bag can be used to keep dirty outfits separated from clean ones in the suitcase. Some other good tips for flying with kids include checking the stroller at the gate instead of at the airline counter. It can be hard for little legs to walk across an entire airport, and most airlines are more than willing to take the stroller at the last minute. In a pinch (like when you forget the stroller entirely, even though you’ve been planning for weeks), small kids who are old enough to keep their balance can “ride” on your wheeled carry-on bag. If you’re traveling by car, you may be able to take more with you, but sometimes it is nice to stick with the “less is more” mentality and really enjoy some quality time. Besides, it’s never fun to clean up all the inevitable mess when you get to your destination or to have to put away a carload of stuff when you return home tired. Busy bags still work great in the car for kids of all ages. Try coming up with different themes – like a color bag where paper, crayons, stickers, and the like are all the same color. Challenge them to get creative with what you have given them and praise their work! Pack a few different busy bags and give each child one at a time so they learn to focus on one project at a time – and also to avoid everything being dumped on the floor of the car all at once. You can also buy small, plastic lap desks for the car ride so kids can have their own space to create, read a book, or have a snack. Individual plastic caddies of the same color can help keep their stuff together and avoid the inevitable fights over whose is whose and make great cup and snack holders. The same travel essentials for public transportation apply in the car. Always carry plenty of wipes and zippered bags for trash or soiled clothes. If you’ve got a long road trip ahead and can’t stand to leave the tablet behind, consider downloading audio books that the whole family can listen to. Make sure to give each child a time limit if they are watching a show or playing a game, and bring headphones so everyone else in the car can focus on a quiet activity until it’s time for their turn on the tablet. Taking a minimal amount of stuff to keep kids entertained on a trip can actually be a fun challenge, and the nice thing about busy bags with paper, stickers, and small snacks is that everything is disposable and doesn’t take up a lot of space. Come up with new ways to do more with less on your next family trip. We bet it will be less stressful and more fun, and you and the kids will enjoy getting creative together with what you have on hand. Do you have any tips to make traveling with kids easier? How about fun games and activities that can be done without bringing a ton of “stuff” along? Leave us your ideas.